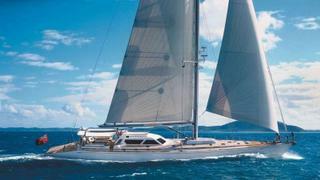 The 40 metre sailing yacht Mirabella has been listed for sale by Dennis Frederiksen at Fraser. Mirabella is the first in a series of sailing yachts designed and built expressly for charter and was launched by Thailand’s Concorde Yachts in 1991. Built in GRP to a design by Bruce Farr, she originally was MCA compliant, but this has been allowed to lapse under her current ownership as she is no longer chartered. Sloop rigged with a carbon fibre mast, she was most recently refitted in 2017 and this yacht for sale also received a new teak deck. Sheltered by a fixed Bimini top, her expansive aft deck has seating and tables for as many as 14 guests for al fresco dining. More formal dining is available in the main saloon, which also comes with comfortable settees and a bar. Flexible accommodation is available for up to 14 guests including two identical VIP suites. There are also four twin cabins, and all staterooms come with television screens and en suite bathroom facilities. In addition, her library has an en suite shower and two Pullman berths, bringing the guest complement up to 14. The interior is in warm teak panelling with LED lighting that can change colour to suit the mood of the guests. Under power, a 550hp Lugger diesel allows a cruising speed of 10 knots and, drawing on 17,000 litre fuel tanks, a range of 3,500 nautical miles. Lying in Imperia, Italy, Mirabella is asking €3,300,000.